Gathering July 3-4 for the Pan-Asian Abundant Health Forum, laity and clergy participated in Hulapalooza, a joyful celebration of healthy living centered on a hula-hoop theme. This event officially launched the Abundant Health initiative in Asia and sought to explore how The United Methodist Church and its partners on this continent can engage in health ministries that transform their communities. After watching a demonstration of the skill, participants had fun hula-hooping and designing their own hoops at a hoop-making station. 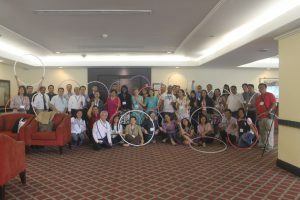 “Spiritual, physical and emotional health is in our DNA,” said Thomas Kemper, Global Ministries’ general secretary in his opening remarks to more than 59 people from 10 countries including Cambodia, China, India, Indonesia, Mongolia, Nepal, Philippines, South Korea, Thailand and the United States. Bishop Ciriaco Q. Francisco of the Manila Episcopal Area welcomed participants. Medical practitioners, health workers and clergy and laity focused on current health ministries, health needs and challenges, networking and partnerships. Promoting abundant health for all, Ige said, is a missional focus. “Abundant health,” she said, “is vibrant mental health to live a quality life, bountiful physical and spiritual health. Hulapalooza will get us moving, laughing and coming together, all in line with our emphasis on mind, body, spirit. Participants are led by Kathleen Griffith and Dr. Glenn Roy Paraso during the opening of the first-ever Abundant Health forum held in Manila, Philippines, on July 3-4, 2018. Dr. Glenn Roy Paraso, executive director of the Mary Johnston Hospital, said Hulapalooza will be the hospital’s communications and dissemination mechanism for its programs. In his opening homily, the Rev. Nezer A. Soriano inspired participants with his words on healing and restoration. “Wouldn’t that be nice,” he asked “if all those who are sick, lonely, hopeless, imprisoned, living in the dark will find a life of abundance in Jesus? Katherine Parker, a Global Ministries missionary from the health team of the United Mission to Nepal, said, “I really appreciate this emphasis on the Abundant Health initiative that seeks to engage and celebrate unique local health ministries as we work in a connected global network for abundant health for all. Parker said the health priorities in Nepal relate to major childhood illnesses and safe motherhood. She noted it is helpful to hear, especially from friends in the Philippines, about the important outreach ministries of the church as the country has moved from a least-developed nation to a middle-income nation. “We are excited to continue to be a partner with Global Health on maternal, neonatal and child health,” she said. “We will take home some specific interventions modeled in other contexts that we can add to how we are working with the population, especially around integration of various nutritional components.” In addition to child and maternal health, Global Health provides funding for the UMN project, the Mary Johnston HIV project and China’s HIV project. Dr. Naomi Equila, Paraso and Soriano shared the country’s current health status along with ministries and initiatives in the Philippines. Tackling substance abuse in communities through family counseling and support. Paraso commented that hosting the forum has “put us on the map of health initiatives and action plans, not only for the conference, but also for the regional Methodist-affiliated countries with health programs. *Mangiduyos is a correspondent for United Methodist News Service.